Our Lady is placing a wedding ring on Saint Robert’s finger. Robert, overwhelmed by so tender a love, offers her his right hand. The painting depicts the Mystical Espousal of Saint Robert to the Virgin Mary, a theme not often represented in art. Even in the annals of holiness, mystical espousal with the Virgin Mary is not encountered very frequently. We hear of it in the lives of Saint Edmund of Canterbury, of the Premonstratensian Saint Hermann–Joseph of Steinfeld, and of the Dominican Alain de la Roche. In the seventeenth century, Saint John Eudes wrote of Our Lady as the spouse of priests, and bound himself to her by means of marriage contract. Does not the liturgy attribute to Our Lady the words of Wisdom in the Book of Proverbs: "I love them that love me" (Prov 8:17)? In the painting I am describing it is clear that the initiative is Our Lady’s. She appears to have drawn Saint Robert upward to herself to receive this ineffable grace binding him to her. Now, the most extraordinary detail, to my mind is this: just above Saint Robert and a little to his right, none other than Saint Joseph is looking on! He is pointing to his staff, the top of which has flowered into a pure white lily. What does this mean? Saint Joseph is saying that intimacy with the Virgin Mary is the secret of holy purity. He is pointing to his flowering staff to say that one bound to Mary, as if by a marriage bond, will be pure. She is the virginizing Bride. 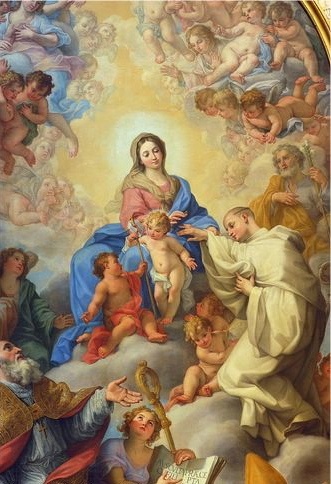 One who obeys the injunction of the angel to Joseph — "Joseph, son of David, fear not to take unto thee Mary thy wife, for that which is conceived in her, is of the Holy Ghost" (Mt 1:15) — will find that she communicates the grace of a fruitful purity to those who bind themselves to her in a permanent and exclusive way. Already in the second chapter of Genesis, God said to Adam, "It is not good for man to be alone; let us make him a help like unto himself" (Gen 2:18). The complement to this word of God to Adam is the word of Jesus Crucified to John: "After that, he saith to the disciple: Behold thy mother. And from that hour, the disciple took her to his own" (Jn 19:27). Every union of a man with a woman, even, and I would say especially, the union of hearts and souls, is ordered to a spiritual fecundity. "Whoso findeth me, findeth life," says Our Lady, "and shall obtain favour of the Lord (Prov 8:35). What exactly is the message of this extraordinary painting? You may recall what Pope Benedict XVI said on the occasion of his visit to the abbey of Heiligenkreuz last September: "Where Mary is, there is the archetype of total self-giving and Christian discipleship. Where Mary is, there is the pentecostal breath of the Holy Spirit; there is new beginning and authentic renewal." Saint Robert’s mission was to launch a new beginning at Cîteaux; it was to foster an authentic renewal of life according to the Rule of Saint Benedict. He could not do this apart from Mary. In the Gospel given us for this feast, Our Lord says: " I have appointed you, that you should go, and should bring forth fruit; and your fruit should remain" (Jn 15:16). Robert’s mystical espousal with the Virgin Mother is the promise and guarantee of spiritual fruitfulness. The same Jesus who says, "Without me you can do nothing" (Jn 15:5), wants us to understand that, by reason of the Father’s mysterious over-arching plan, without Mary, the Mediatrix of All Graces, we can do nothing. "When the fulness of the time was come, God sent his Son, made of a woman" (Gal 4:4). Just as the first creation required the presence and collaboration of Eve at Adam’s side, so too does the new creation, and every particular manifestation of it, be it personal or corporate, require the presence and collaboration of Mary, the New Eve, at the side of Christ, the New Adam. Cîteaux was a new creation, a particular corporate manifestation of the Kingdom of God in all its newness. The same may be said of every authentic reform and renewal of monastic life in the history of the Church. Whenever and wherever the Blessed Virgin Mary is welcomed and loved, she attracts a mysterious descent of the Holy Spirit. Our Lady prays for us at every moment, saying, "Thou shalt send forth thy spirit, and they shall be created: and thou shalt renew the face of the earth" (Ps 103:30). In 1099, one year after the foundation of the New Monastery at Cîteaux, Saint Robert was obliged, by a bull of Pope Urban II, to return to the abbey of Molesme as abbot. He remained there until his death in 1111. Saints Alberic and Stephen Harding succeeded him as abbots of Cîteaux. Abbot Robert’s love for Our Lady, the Virgin Mother who had placed a ring on his finger, was part of his legacy. Cîteaux flourished because Mary was present there, present as she was in the house of Saint Joseph, her most chaste spouse; present as she was in the house of Saint John, the Beloved Disciple; and present as she was in the midst of the apostles on the first Pentecost. Weakness, fear, tribulation, and humiliations are unavoidable in the Christian life. Each of us carries the precious gifts of God in his own peculiar frailty. Saint Paul said it in the First Reading, "But we have this treasure in earthen vessels, that the excellency may be of the power of God, and not of us. In all things we suffer tribulation, but are not distressed; we are straitened, but are not destitute; we suffer persecution, but are not forsaken; we are cast down, but we perish not" (2 Cor 4:7-9). The Blessed Virgin Mary is accustomed to carrying earthen vessels. The secret of holiness is to place our weakness in her immaculate hands. She who placed a wedding ring on Abbot Robert’s finger will not deny us the grace of a fruitful intimacy with her Most Pure Heart. It is with His Mother, and through her, that Our Lord fulfills the promise made to Saint John on Patmos: "Behold, I make all things new" (Ap 21:5).